The Adventure Rack Base Rack System for Trucks is the one rack that Yakima and Thule forgot to make. It's simplicity and versatility make it the ultimate rack for truck owners everywhere. In the simplest of terms, the Adventure Rack is the ultimate base rack for your truck. It mimics the base rack on a car or van roof and provides a stable platform that will accept any rack or carrier system that is designed to be mounted on a car, van, or crossover vehicle's roof. There are two versions of our truck racks: The Bolt-On model and the Pocket Mount Option. The Bolt-On model bolts directly onto your truck (or trailer), and the Pocket Mount model uses a patented wedge-style fitting that slides into your truck's pocket holes and creates a stable and secure attachment platform. Once the fittings are attached to your truck, the rails go on next. The stable rails allows you to custom fit your truck box length to provide a stable, secure platform in any position you'd like. The Universal Mounting Tubes are the equivalent of the load-bars on a roof-style base rack which makes it easy to securely attach rails. These mounting bars will accept racks that are designed to be mounted on your car's roof. What's the advantage to using a Base Rack System from Marquette Mounts instead of a traditional hitch-style rack for my truck? The Adventure or Overland Truck Racks allow you to re-use your car's roof-based bike rack, kayak rack, ski rack, rocket box, or cargo box. Just because you traded your car for a truck doesn't mean your old carrier system is useless! Our Truck Racks are easy to attach your gear to because they are accessible from both the side and back of your truck. No more worrying about scratching your vehicle as you wrestle to put your gear up on the roof. 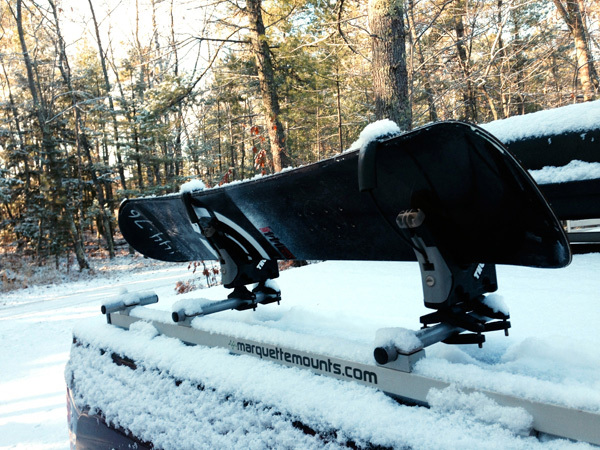 By securing your gear using a Marquette Mounts Base Rack system, your bikes, skis, snowboards, and other gear remain secure and stable. There will no longer be any damage to your gear from it sliding and banging around in the back of your truck. By mounting your toys on a Base Rack system instead of throwing them in the back of your truck, your truck box remains open giving you lots of room to haul other gear. It is easy, quick, and efficient to swap carrier systems on both the Adventure Rack and the Overland Truck Rack so you can go mounting biking in the morning and kayaking in the evening. The Adventure Rack is a single-side mounting system that allows you to attach existing roof mounting racks or carriers on one side of the back of your truck. The mounting bars are 20 inches wide so you can typically fit a 2-bike carrier, a cargo box (commonly known as a rocket box), a double ski rack, or a boat, paddle or surfboard mount. Using an Adventure Rack base rack systems frees up your truck bed AND your hitch so you can haul even more toys and gear! What Can I Haul with the Adventure Rack or Overland Rack from Marquette Mounts? Find your sport below to read more about what you can haul with an Adventure Rack System for your truck. Haul it All with an Adventure Rack Truck Rack! With an Adventure Rack for trucks, getting your bike(s) to your destination just became a whole lot easier. Best of all, you can carry your bike(s) AND keep the bed of your truck free for the gear you'll need to keep the party going after your ride. Now you can use your rocketbox on your truck! 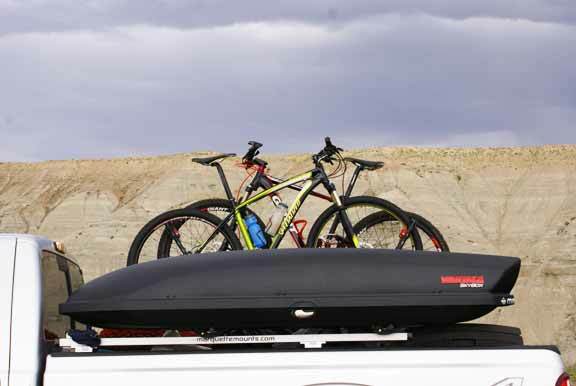 The Adventure Rack for Trucks can carry standard size cargo boxes from Yakima, Thule, and other cargo box companies. Using a cargo box on your truck is like giving your truck and easily-accesible, lockable trunk. By mounting it on the side of your truck, you leave the entire truck bed open for other things. Best of all, the cargo box is now accessible from the side of your truck meaning you don't need to jump up in the back of your truck to get at it! One of the perks of owning a truck is that you can quickly slide your skis or snowboards in the back and head out. But that's also the problem. As easily as your expensive skis slide in, they also end up sliding around unprotected as you drive around. Let's face it, it's only a matter of time before you end up with broken tips, broken bindings, or at the very least, scratched bottoms and chipped edges. By using a roof-based ski carrier, ski box, or snowboard carrier system on your truck, you can protect your toys AND prevent theft. Plus, it j ust looks really cool to have your skis/boards on display along the side of your truck instead of hiding them in the back. With a truck-mounted kayak, canoe, or surfboard carrier, you can safely load and carry your boat wherever you want to go. Best of all, by mounting your boat with on the side of your truck box, your entire truck bed remains free and open for the rest of the important gear you'll need for the after-paddle beach party. The popularity of Overland Adventure Travel is exploding across every continent on the planet. Luckily, you don't have to venture across the ocean just to find adventure. By mounting a roof-mount tent onto the back of your truck via an Overland Rack System, you are ready for the ultimate adventure, and you even have room to haul your favorite toys with you! By using an Overland Rack Base Rack for Trucks System on the back of your truck, you can mount all standard roof-top tents.